The 9 Best Christmas Tree Farms in Delaware! The holidays have arrived and now it’s all about twinkling lights, pine-scented candles, and picking out a Christmas tree at a local farm. This annual tradition is among the first activities on the agenda for the holidays. Here are the 10 best Christmas tree farms in Delaware. Established in 2008 by Don and Peggy Hallowell, Don’t Tree Farm boasts 40 acres of u-pick/they cut Christmas trees. 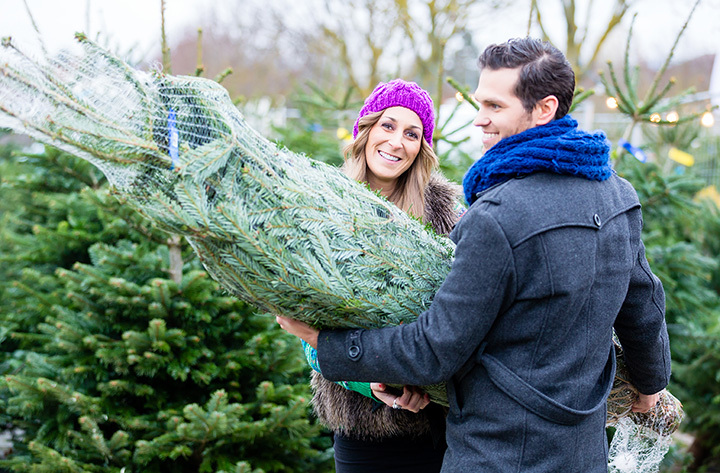 With a variety of trees to choose from, this includes Fraser Fir, Norway spruce, and more. And though trees are available for tagging during the fall season, you must pre-pay. And don’t forget to help others to stay warm this winter by donating hats, scarfs, gloves, or mittens to the farm. With some trees topping out over 15 feet-tall, Landis offers varieties like, Douglas fir, Canaan fir, concolor fir, pre-cut Fraser fir, white spruce, Norway spruce, and more. In 19991 Lorna and Jim Landis planted their first tree on 21 acres, and today the farm is filled with thousands of Christmas trees just waiting for you and your family to pick one out. When you do, someone from the farm will cut it down and wrap it up so that you can take it home. The first Christmas trees at Coleman were planted in 1955, and more trees have been planted every year. Get a wide selection of Douglas fir, u-pick, pre-cut, and handmade wreaths. Also, the on-site bake shop sells fresh baked goods and hot drinks. And be on the lookout for Santa, as he is said to roam the fields looking for the perfect tree throughout December. Established in 1965, Loblolly offers 10 acres of Christmas trees and winter activities for the entire family, including winter hayrides, nature trails, a straw maze, and a unique petting zoo. Offering school tours and more, Loblolly also has a gift shop and onsite cafe offering soups, chilies, and other winter warmers. Plus, don’t miss special events, like a visit from Santa himself. Established in 1895, Cardinal Woods is comprised of third and fourth generation farmers. Today, the farm is enrolled in the State Delaware Farmland Preservation Program, keeping it from ever being developed. There are thousands of trees on this 250-acre farm, from Fraser fir, Douglas fir, Colorado blue spruce, and Norway spruce to white pine. Established in 1986 by Tom and Roseann Conlon, the couple intended the farm to be a rural retreat and farming enterprise. The tree farm is, in the couple’s own words, “just one example of what the human spirit can achieve.” Find Colorado blue spruce, white spruce, Norway spruce, eastern white pine, Douglas fir, and Canaan fir. This is a cut-your-own farm offers bonfire, horses, and the Potter and the Chimney Sweep Gift Shoppes. Cutting your own tree in the field is a family tradition that dates back centuries, so take a step back in time, sit by the warm glow of a campfire, and partake in some hot apple cider. Then, while the Christmas music falls over the farm, you can choose from white pine, Fraser fir, and Canaan fir trees. Established in 2014 by Pat and Bonnie Dyer, at Dyer's you will find hundreds of Douglas fir, Norway spruces, and blue spruces. Some trees are over 12 feet in tall at this u pick/they cut farm. You can even dig your own tree if you like, and fresh wreaths are available, too. Dyer Farm is a proud member of the Delaware Christmas Tree Growers Association.